Because you're a reader of Linux Journal, you probably already know that Linux has a rich virtualization ecosystem. KVM is the de facto standard, and VirtualBox is widely used for desktop virtualization. Veterans should remember Xen (it's still in a good shape, by the way), and there is also VMware (which isn't free but runs on Linux as well). Plus, there are many lesser-known hypervisors like the educational lguest or hobbyist Xvisor. In such a crowded landscape, is there a place for a newcomer? There likely is not much sense in creating yet another Linux-based "versatile" hypervisor (other than doing it just for fun, you know). But, there are some specific use cases that general-purpose solutions just don't address quite well. One such area is real-time virtualization, which is frequently used in industrial automation, medicine, telecommunications and high-performance computing. In these applications, dedicating a whole CPU or its core to the software that runs bare metal (with no underlying OS) is a way to meet strict deadline requirements. Although it is possible to pin a KVM instance to the processor core and pass through PCI devices to guests, tests show the worst-case latency may be above some realistic requirements (see Resources). As usual with free software, the situation is getting better with time, but there is one other thing—security. Sensitive software systems go through rigorous certifications (like Common Criteria) or even formal verification procedures. If you want them to run virtualized (say, for consolidation purposes), the hypervisor must isolate them from non-certifiable workloads. This implies that the hypervisor itself must be small enough; otherwise, it may end up being larger (and more "suspicious") than the software it segregates, thus devastating the whole idea of isolation. So, it looks like there is some room for a lightweight (for the real-time camp), small and simple (for security folks) open-source Linux-friendly hypervisor for real-time and certifiable workloads. That's where Jailhouse comes into play. Jailhouse was born at Siemens and has been developed as a free software project (GPLv2) since November 2013. Last August, Jailhouse 0.1 was released to the general public. Jailhouse is rather young and more of a research project than a ready-to-use tool at this point, but now is a good time to become acquainted it and be prepared to meet it in production. From the technical point of view, Jailhouse is a static partitioning hypervisor that runs bare metal but cooperates closely with Linux. This means Jailhouse doesn't emulate resources you don't have. It just splits your hardware into isolated compartments called "cells" that are wholly dedicated to guest software programs called "inmates". One of these cells runs the Linux OS and is known as the "root cell". Other cells borrow CPUs and devices from the root cell as they are created (Figure 1). Besides Linux, Jailhouse supports bare-metal applications, but it can't run general-purpose OSes (like Windows or FreeBSD) unmodified. As mentioned, there are plenty of other options if you need that. One day Jailhouse also may support running KVM in the root cell, thus delivering the best of both worlds. 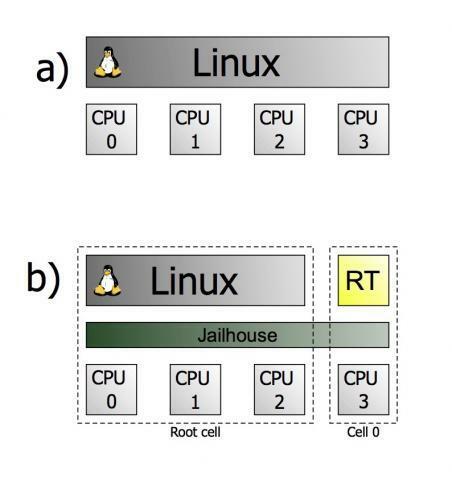 As mentioned previously, Jailhouse cooperates closely with Linux and relies on it for hardware bootstrapping, hypervisor launch and doing management tasks (like creating new cells). Bootstrapping is really essential here, as it is a rather complex task for modern computers, and implementing it within Jailhouse would make it much more complex. That being said, Jailhouse doesn't meld with the kernel as KVM (which is a kernel module) does. It is loaded as a firmware image (the same way Wi-Fi adapters load their firmware blobs) and resides in a dedicated memory region that you should reserve at Linux boot time. Jailhouse's kernel module (jailhouse.ko, also called "driver") loads the firmware and creates /dev/jailhouse device, which the Jailhouse userspace tool uses, but it doesn't contain any hypervisor logic. Jailhouse is an example of Asynchronous Multiprocessing (AMP) architecture. Compared to traditional Symmetric Multiprocessing (SMP) systems, CPU cores in Jailhouse are not treated equally. Cores 0 and 1 may run Linux and have access to a SATA hard drive, while core 2 runs a bare-metal application that has access only to a serial port. As most computers Jailhouse can run on have shared L2/L3 caches, this means there is a possibility for cache thrashing. To understand why this happens, consider that Jailhouse maps the same guest physical memory address (GPA) to a different host (or real) physical address for different inmates. If two inmates occasionally have the same GPA (naturally containing diverse data) in the same L2/L3 cache line due to cache associativity, they will interfere with each other's work and degrade the performance. This effect is yet to be measured, and Jailhouse currently has no dedicated means to mitigate it. However, there is a hope that for many applications, this performance loss won't be crucial. Now that you have enough background to understand what Jailhouse is (and what it isn't), I hope you are interested in learning more. Let's see how to install and run it on your system. Sometimes you may need the very latest KVM and QEMU to give Jailhouse a try. KVM is part of the kernel, and updating the critical system component just to try some new software probably seems like overkill. Luckily, there is another way. kvm-kmod is a tool to take KVM modules from one kernel and compile them for another, and it usually is used to build the latest KVM for your current kernel. The build process is detailed in the README, but in a nutshell, you clone the repository, initialize a submodule (it's the source for KVM), and run the configure script followed by make. When the modules are ready, just insmod them instead of what your distribution provides (don't forget to unload those first). If you want the change to be permanent, run make modules_install. kvm-kmod can take the KVM sources from wherever you point to, but the defaults are usually sufficient. Compiling QEMU is easier but more time consuming. It follows the usual configure && make procedure, and it doesn't need to be installed system-wide (which is package manager-friendly). Just put /path/to/qemu/x86_64-softmmu/qemu-system-x86_64 instead of plain qemu-system-x86_64 in the text's examples. Despite having a 0.1 release now, Jailhouse still is a young project that is being developed at a quick pace. You are unlikely to find it in your distribution's repositories for the same reasons, so the preferred way to get Jailhouse is to build it from Git. To run Jailhouse, you'll need a recent multicore VT-x-enabled Intel x86 64-bit CPU and a motherboard with VT-d support. By the time you read this article, 64-bit AMD CPUs and even ARM (v7 or better) could be supported as well. The code is already here (see Resources), but it's not integrated into the mainline yet. At least 1GB of RAM is recommended, and even more is needed for the nested setup I discuss below. On the software side, you'll need the usual developer tools (make, GCC, Git) and headers for your Linux kernel. Running Jailhouse on real hardware isn't straightforward at this time, so if you just want to play with it, there is a better alternative. Given that you meet CPU requirements, the hypervisor should run well under KVM/QEMU. This is known as a nested setup. Jailhouse relies on some bleeding-edge features, so you'll need at least Linux 3.17 and QEMU 2.1 for everything to work smoothly. Unless you are on a rolling release distribution, this could be a problem, so you may want to compile these tools yourself. See the Getting Up to Date sidebar for more information, and I suggest you have a look at it even if you are lucky enough to have the required versions pre-packaged. Jailhouse evolves and may need yet unreleased features and fixes by the time you read this. Make sure you have nested mode enabled in KVM. Both kvm-intel and kvm-amd kernel modules accept the nested=1 parameter, which is responsible just for that. You can set it manually, on the modprobe command line (don't forget to unload the previous module's instance first). Alternatively, add options kvm-intel nested=1 (or the similar kvm-amd line) to a new file under /etc/modprobe.d. You also should reserve memory for Jailhouse and the inmates. To do this, simply add memmap=66M$0x3b000000 to the kernel command line. For one-time usage, do this from the GRUB menu (press e, edit the command line and then press F10). To make the change persistent, edit the GRUB_CMDLINE_LINUX variable in /etc/default/grub on the QEMU guest side and regenerate the configuration with grub-mkconfig. As the command returns, type dmesg | tail. If you see "The Jailhouse is opening." message, you've successfully launched the hypervisor, and your Linux guest now runs under Jailhouse (which itself runs under KVM/QEMU). If you get an error, it is an indication that your CPU is missing some required feature. If the guest hangs, this is most likely because your host kernel or QEMU are not up to date enough for Jailhouse, or something is wrong with qemu-vm cell config. Jailhouse sends all its messages to the serial port, and QEMU simply prints them to the terminal where it was started (Figure 2). Look at the messages to see what resource (I/O port, memory and so on) caused the problem, and read on for the details of Jailhouse configuration. Figure 2. A typical configuration issue: Jailhouse traps "prohibited" operation from the root cell. Creating Jailhouse configuration files isn't straightforward. As the code base must be kept small, most of the logic that takes place automatically in other hypervisors must be done manually here (albeit with some help from the tools that come with Jailhouse). Compared to libvirt or VirtualBox XML, Jailhouse configuration files are very detailed and rather low-level. The configuration currently is expressed in the form of plain C files (found under configs/ in the sources) compiled into raw binaries; however, another format (like DeviceTree) could be used in future versions. Most of the time, you wouldn't need to create a cell config from scratch, unless you authored a whole new inmate or want the hypervisor to run on your specific hardware (see the Jailhouse for Real sidebar). 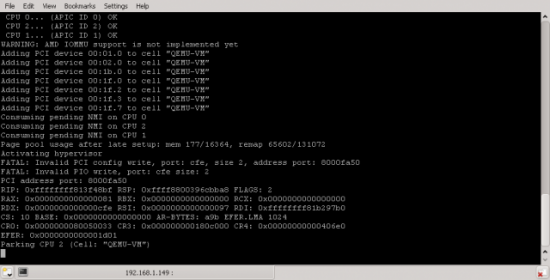 Cell configuration files contain information like hypervisor base address (it should be within the area you reserved with memmap= earlier), a mask of CPUs assigned to the cell (for root cells, it's 0xff or all CPUs in the system), the list of memory regions and the permissions this cell has to them, I/O ports bitmap (0 marks a port as cell-accessible) and the list of PCI devices. Each Jailhouse cell has its own config file, so you'll have one config for the root cell describing the platform Jailhouse executes on (like qemu-vm.c, as you saw above) and several others for each running cell. It's possible for inmates to share one config file (and thus one cell), but then only one of these inmates will be active at a given time. apic-demo.cell is the cell configuration file that comes with Jailhouse (I also assume you still use the QEMU setup described earlier). This cell doesn't use any PCI devices, but in more complex cases, it is recommended to unload Linux drivers before moving devices to the cell with this command. Jailhouse treats all inmates as opaque binaries, and although it provides a small framework to develop them faster, the only thing it needs to know about the inmate image is its base address. Jailhouse expects an inmate entry point at 0xffff0 (which is different from the x86 reset vector). apic-demo.bin is a standard demo inmate that comes with Jailhouse, and the inmate's framework linker script ensures that if the binary is mapped at 0xf0000, the entry point will be at the right address. apic-demo is just a name; it can be almost anything you want. apic-demo is purely a demonstrational inmate. It programs the APIC timer (found on each contemporary CPU's core) to fire at 10Hz and measures the actual time between the events happening. Jitter is the difference between the expected and actual time (the latency), and the smaller it is, the less visible (in terms of performance) the hypervisor is. Although this test isn't quite comprehensive, it is important, as Jailhouse targets real-time inmates and needs to be as lightweight as possible. The result is shown in Figure 3. "IMB-A180" is the root cell's name. Other cells also are listed, along with their current states and CPUs assigned. The "Failed CPUs" column contains CPU cores that triggered some fatal error (like accessing an unavailable port or unassigned memory region) and were stopped. Figure 3. Jailhouse cell listing—the same information is available through the sysfs interface. You'll see something akin to Figure 4. The data is updated periodically (as with the top utility) and contains various low-level counters like the number of hypercalls issued or I/O port accesses emulated. The lifetime total and per-second values are given for each entry. It's mainly for developers, but higher numbers mean the inmate causes hypervisor involvement more often, thus degrading the performance. Ideally, these should be close to zero, as jitter in apic-demo. To exit the tool, press Q. Figure 4. Jailhouse cell statistics give an insight into how cells communicate with the hypervisor. What's the reason for this? Remember the apic-demo cell had the "running/locked" state in the cell list. Jailhouse introduces a locked state to prevent changes to the configuration. A cell that locks the hypervisor is essentially more important than the root one (think of it as doing some critical job at a power plant while Linux is mostly for management purposes on that system). Luckily, apic-demo is a toy inmate, and it unlocks Jailhouse after the first shutdown attempt, so the second one should succeed. Execute the above command one more time, and apic-demo should disappear from the cell listing. Look at com2.txt in the host (the same directory you started QEMU from). Not only does this show that cells can be re-used by the inmates provided that they have compatible resource requirements, it also proves that Jailhouse can run 32-bit inmates (the hypervisor itself and the root cell always run in 64-bit mode). For this to succeed, there must be no cells in "running/locked" state. This is the end of our short trip to the Jailhouse. I hope you enjoyed your stay. For now, Jailhouse is not a ready-to-consume product, so you may not see an immediate use of it. However, it's actively developed and somewhat unique to the Linux ecosystem, and if you have a need for real-time application virtualization, it makes sense to keep a close eye on its progress. QEMU is great for giving Jailhouse a try, but it's also possible to test it on real hardware. However, you never should do this on your PC. With a low-level tool like Jailhouse, you easily can hang your root cell where Linux runs, which may result in filesystem and data corruption. The configuration tool reads many files under /proc and /sys (either collected or directly), analyzes them and generates memory regions, a PCI devices list and other things required for Jailhouse to run. Post-processing the generated config is mostly a trial-and-error process. You enable Jailhouse and try to do something. If the system locks up, you analyze the serial output and decide if you need to grant access. If you are trying to run Jailhouse on a memory-constrained system (less than 1GB of RAM), be careful with the hypervisor memory area, as the configuration tool currently can get it wrong. Don't forget to reserve memory for Jailhouse via the kernel command line the same way you did in QEMU. On some AMD-based systems, you may need to adjust the Memory Mapped I/O (MMIO) regions, because Jailhouse doesn't support AMD IOMMU technology yet, although the configuration tool implies it does. 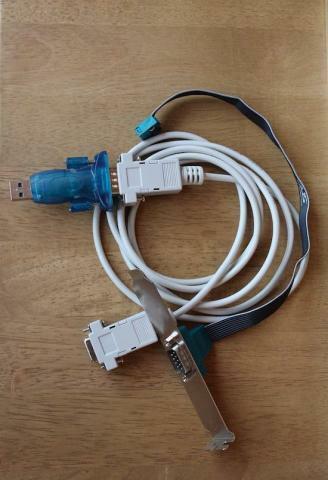 To capture Jailhouse serial output, you'll likely need a serial-to-USB adapter and null modem cable. Many modern motherboards come with no COM ports, but they have headers you can connect a socket to (the cabling is shown in Figure a). Once you connect your board to the main Linux PC, run minicom or similar to see the output (remember to set the port's baud rate to 115200 in the program's settings).